MARY McKENNA SIDDALS is the author of several picture books for the very young, including Millions of Snowflakes. In addition, she has written dozens of children’s stories, articles, poems, and activities appearing in a variety of magazines. A former teacher, she lives in British Columbia, Canada, where she enjoys tending to her own batch of Compost Stew. ASHLEY WOLFF is the author and/or illustrator of more than sixty children’s books, including Baby Beluga; I Love My Mommy Because; I Love My Daddy Because; Mama’s Milk; Stella and Roy Go Camping; I Call My Grandma Nana; I Call My Grandpa Papa; When Lucy Goes Out Walking; and the beloved Miss Bindergarten series. Ashley wrangles thousands of red wriggler compost worms in her San Francisco backyard garden. She grows flowers, vegetables, and an amazingly prolific persimmon tree. 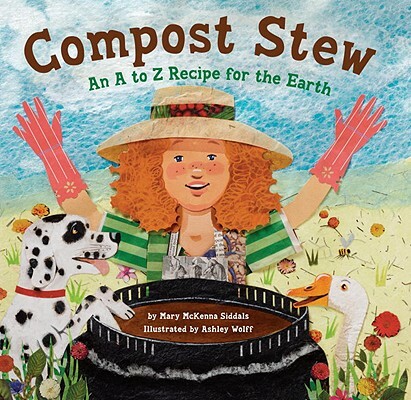 "An imaginative and engaging introduction to the concept of composting." "This wonderful rhyming picture book will show children how easy, and how fun, composting can be." "Bouncy rhymes and busy collage art zip along as everything from apple cores to zinnia heads gets tossed into a rich and rotting soil-bound mix. A potentially heavy-handed message is delivered with a light touch so that you want to start your own waste heap right away. Mission accomplished!" "When it comes to promoting environmentalism, there's no harm in starting young....Ashley Wolff's collage-style illustrations, made from newspaper, tea bags and other recycled materials, echo writer Mary McKenna Siddals's message of reducing waste." "This title highlights a subject rarely covered in youth books and provides a lighthearted introduction to an earth- and kid-friendly activity. The brightly patterned collage artwork featuring a cast of multicultural kids working together will easily draw a young audience."